Mevagissey Cornwall Sea Angling, Charter Boats, Mackerel Trips, Quay fishing, Tackle Shops. Mevagissey is the fishing heart of the south Cornish coast ! Take an hours mackerel trip, or go angling for the day on one of the many charter boats from Mevagissey harbour. You can go fishing from Mevagissey or cruising, taking in the scenery with a chance of seeing basking sharks, dolphins and seals. Catch a mackerel off the back of the quay, there's plenty of room for everyone. Mevagissey House former vicarage with 4 self-catering holiday cottages. 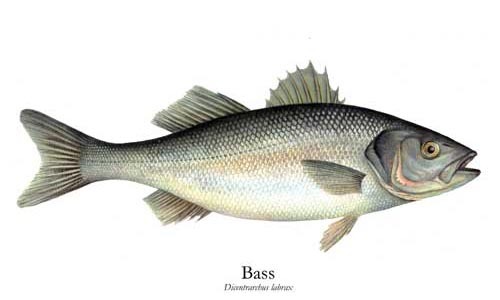 Bass Go Deeper - Welcome to breathtaking Cornwall, with some of the finest Bass angling in Europe. Professional Bass Guide, Nick Mackrory, will help you explore and understand lure or fly fishing next to the stunning backdrop of the Cornish coast and help you improve your predator species fishing. Choose from shore fishing or a specialised boat charter. Bass Go Deeper welcomes rookie and expert anglers alike. Diligence is a 30ft traditional commercial fishing boat with plenty of deck space. Skipper Matt has been commercially fishing from Mevagissey all his life and has been doing trips for the last 10 years in the summer season. He has an excellent knowledge of the local waters to help you get on the fish. The Aquila - One of Mevagisseys best charter fishing boats. Aquila is a lochin 33 with a mermaid 212hp engine that pushes us along at a comfortable 10/12 knots. Aquila is fitted with the latest safety and navigation equipment, 8 man and 6 man life rafts, lifejackets. Navico Axis RT 1400 VHF Furuno radar/plotter, Furuno GRP GP-30 Navigator and Furuno GRP GP-32 Navigator, Sinrad Cp31 Chart Plotter. Furuno echo sounder/colour fish finder, for pinpoint accuracy in locating and drifting wrecks and reefs or returning to reported sightings of Whales or Dolphins. Venus - John Arthur is a Cornish fisherman that comes from and operates out of a small coastal fishing village in Cornwall, called Mevagissey. We offer a service, where anything you catch, you keep!!! This means, you could catch a boats load of fish and you can take it all home with you. He currently operates out of a fairly sized boat called 'Venus', the 'Venus' can currently hold up to 12 people, all sitting. Bessie Vee Charters - The MV Bessie Vee is a spacious, swift charter boat which will transport you rapidly to where you want to fish, film or sightsee in the minimum time and in comfort. A 39ft Cygnus Cyfish with over 260sq ft of deck space and a large wheelhouse, the Bessie Vee is licensed and equipped to carry 11 passengers up to 60 miles from a safe haven. She has a 12 litre 500hp Scania engine, enabling her to cruise comfortably at 14-15 knots, with a top speed of 20 knots. Mevagissey Holiday Cottages is a small family-run cottage agency located in Mevagissey. We know all the properties in great detail, and are always happy to answer any questions you may have. Tel: 01726 842525. Planet Sea Fishing - the freshest and most informative sea angling magazine anywhere! Boats and Outboards - Welcome to BoatsandOutboards.co.uk - the number one website in the UK for boats for sale.